Frank and Nancy Semmerling never had any desire to own a restaurant. Frank was semi-retired after he sold his business, Semmerling Fence & Supply Inc., in Wheeling, and Nancy enjoyed being a homemaker. Maxson, 1469 Illinois 2, first opened as a restaurant in 1952. The riverboat wasn’t launched until the late 1980s, and has since become Oregon’s largest attraction. Richard Wiesner bought the business in 1993 and seven months later, a fire destroyed the building. Wiesner invested $750,000 to build a new 6,000 square-foot building, and owned the business until 2013. Now retired, Wiesner and his son, Richie, serve as captains of the Pride of Oregon. The glass-enclosed restaurant features tiered seating, giving customers a panoramic view of the Rock River. “We see turkeys, pelicans, deer and eagles,” says Nancy. In addition to the main dining room, the restaurant has private dining rooms upstairs for meetings and other special events. A spacious outdoor deck is perfect for dining during the summer months. Guests are treated to musical entertainment on weekends. The main attraction is the Pride of Oregon, which the owners describe as “102 feet of real river charm.” The riverboat holds 149 passengers and is fully climate controlled. The Pride of Oregon is popular for wedding ceremonies, reunions and lunch and dinner cruises. Lunch tours are $30 for adults, $28 for seniors and $20 for children 6-12; five and under free. Dinner is $35 for adults, $33 for seniors and $20 for children. Sightseeing tours are available starting at $15. Excursions are available 11 a.m. 2:30 p.m. and 5:30 p.m. Tuesday through Sunday by reservation. Maxson has a Friday night fish fry, a Saturday night Texas barbecue and a Sunday brunch. It’s open on all major holidays. Over the years, Maxson has hosted weddings, retirement parties and family reunions in the restaurant, the outdoor deck and on the riverboat. The Semmerlings are hoping to expand this part of the business. 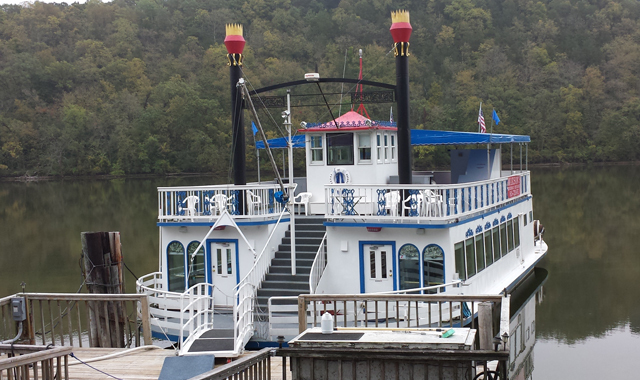 The restaurant also draws business to the Paddle Wheel Inn, a 39-room hotel located next door. Maxson is open Tues.-Sat. from 11 a.m. to 9 p.m., Sunday 10 a.m.-3 p.m. This entry was posted on Friday, October 30th, 2015 at 11:59 am	and is filed under Dining Guide. You can follow any responses to this entry through the RSS 2.0 feed. Both comments and pings are currently closed.